I’ve been a Mega Man fan literally since before I can remember. My parents got a bootleg copy of the awful Mega Man 3 DOS version (don’t copy that floppy!) before I could talk, and I have fond memories of watching them play on their Tandy 1000 with monochrome monitor. I was also quite obsessed with the Ruby Spears Mega Man cartoon growing up. Being pretty much a lifelong PC gamer, I didn’t get to own many of the Mega Man games until later (I jumped on the Nintendo bandwagon just as Capcom was jumping off), but I did find PC copies of a couple of the games in the Mega Man X series, and it remains one of my favorite series in the franchise. It retains the spirit of the Classic series, while adding new progression, such as armor upgrades and health expansions, that give you a reason to replay and explore levels, as you often need a weapon acquired from one of the other bosses to get into secret areas. I also felt like the difficulty of the X series was a lot more well balanced than any of the other series in the franchise. So when Capcom announced that they were releasing Mega Man X Legacy Collection 1 & 2 (containing X1-X4 and X5-X8, respectively), I knew I had to get it. First of all, I’d like to say that, for years, all things being equal, if a game came out on both console and PC, I would always choose the PC version without hesitation. Nintendo has recently broken me of that habit, however, with the Switch. My internal argument in favor of PC is that I can play either in front of my computer or on the TV with a controller via various streaming schemes (Steam Link works really well for me! ), whereas, with console you’re stuck only playing on the TV, and if my wife wants to watch TV while I want to play, one of us is out of luck. With the Switch I can play on the TV or in tablet mode, which has been the first console feature to lure me away from PC. Of course, if we were talking about a game with high end graphics I would still definitely go for the PC version, because the Switch, while remarkably powerful for a device of its size, is still a tablet, and can’t hope to match the quality of a full size computer. But we’re not talking about high end graphics, we’re talking about mostly 2D pixel art games, so Switch it was. Gameplay-wise, these games are just as you remember them (terrible dubbing and all!). The emulation is really great. The audio is crisp with no stutters or pops. Since these games were all made for standard ratio, and the modern widescreen format is slightly taller than that, the game comes with the option to either stretch it to full height with slight scaling blur, present it in pixel-perfect scale with a border, or, if you’re some kind of animal, stretch it to widescreen. There is some occasional slowdown, but I’m told there was in the original SNES release as well. Some sites I’ve seen are saying it chugs in places it shouldn’t, but I never owned an SNES so I can’t say for sure. I do feel like X1 runs better than the SNES Classic version for whatever that’s worth. There are no rewind or savestate options (other than saving at save screens so you don’t have to write down that massive password matrix), which seems a bit odd given that these features were included in the classic Mega Man Legacy Collection, but I kind of like it; rewinds and save states cheapen the original experience. If you’re having trouble with difficulty, there’s a new novice mode that makes the game a little less punishing. Plus I imagine that all of that gets more complicated as you get into emulating more complex systems like the PS1 and PS2. Over the years I’ve found various ways to play Mega Man X 1-5 (well, I guess I had X6 in the Anniversary Collection as well, but I don’t think I ever got around to trying it as I’ve always heard it’s a trainwreck), but this is my first time playing the PS2 games. Putting the PS1 and PS2 games next to each other is a good argument for why some games should have stuck with pixelart, and X7 in particular is a very good argument for why Mega Man should have stuck to 2D platformers. I didn’t even make it through the tutorial stage because of the wonky controls. Worst of all is when the game abruptly switches from 2D to 3D without warning, which caused me to almost died more than once because suddenly holding right on the control stick goes from running forward to running right off of a cliff. Nevertheless, I’m glad to finally get the chance to experience these later games, even if they are mediocre compared to the earlier ones. It’s worth noting that the physical version, in a bizarre move on the part of Capcom, contains a physical cartridge of Collection 1 and a code for a download of Collection 2. It seems like they were just too cheap to spring for the cartridge size large enough to hold both collections. I’m honestly not bothered by it as much as some people are, it’s just weird. Oh, and I feel I should also go on record that the changes to the boss names in Mega Man X5 to not be weird references to members of Guns N’ Roses is a great change. Thank you, that has always bothered me, even before I knew the story behind it. 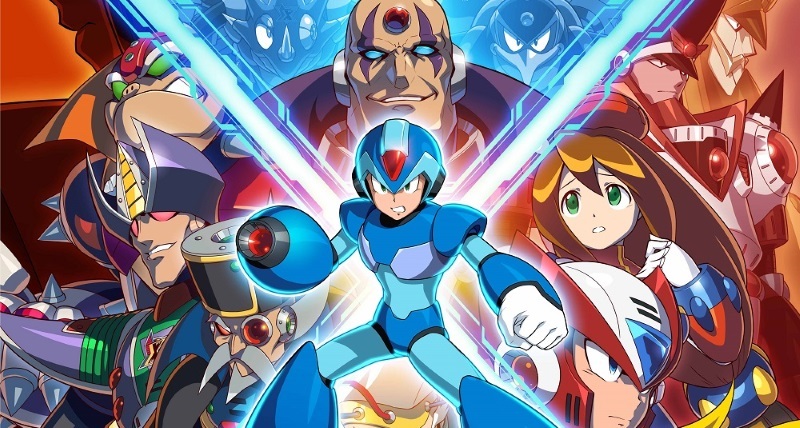 Overall, I’m very pleased with the collection, and I hope it heralds the return of the X series just as the classic Legacy Collection heralded Mega Man 11. Now if you’ll excuse me, there are some Mavericks that need my attention.